A little before midnight on 30 August, 1950, TWA Flight 903 from Bombay to New York took off on the second leg of its journey after the customary stopover in Cairo. The weather was good and “The Star of Maryland” was set for a fairly leisurely flight to Rome, the final stopover before crossing the Atlantic. Yet shortly after reaching 10,000 feet, the plane turned around. Much to the alarm of the crew, flames had been spotted emerging from the number three engine. A priority landing was requested in Cairo. Minutes later the engine fell free, forcing the pilot to make an emergency descent into the Sahara Desert. Shrouded in darkness, the plane exploded on impact and there were no survivors. Twelve nations were represented amongst the 48 passengers. A number of prominent businessmen were on board, as well as a dean of MIT and an Egyptian film star. Also on the flight was a 40-year-old architect whose dashing looks might too have seemed at home on the silver screen. Maciej Nowicki (Matthew Nowicki as he was known in the U.S.) was travelling from India as he was in the midst of one of the most extraordinary building projects of the age. The freshly independent country had commissioned a new capital for the state of Punjab. Nowicki, who had been working in the States since shortly after the war, had been taken on as the chief architect of the metropolis. As one of the rising stars of his generation, the Pole had recently designed what was to be the world’s first hanging roof. He talked of “an architecture of the future, liberated from gravity.” A creative thinker, who was disinclined to follow the rigid dictates of fashion, Nowicki championed “architecture of functional flexibility”, as opposed to the “functional exactitude” so religiously followed by the Modernist pack. On the 60th anniversary of Nowicki’s untimely demise, the Post spoke to Dr. Marta A. Urbańska, architect, architectural historian and critic. She is adjunct professor at the Cracow University of Technology, where she wrote her doctorate on Nowicki in 2000. Krakow Post: If the Second World War had not broken out, it’s conceivable that Maciej Nowicki would never have ended up working abroad, be it in America, India or elsewhere. However, he was not the only Pole to be involved in an Indian odyssey in the middle of the last century. Marta Urbańska: Maciej Nowicki, undoubtedly one of the greatest – albeit sadly not very well known – architects of the 20th century, was indeed one of the Poles who worked in India. However, the conditions of his work there differed from the other personalities which I imagine you had in mind, such as Mr. Stefan Norblin, who famously was in India during the war, working for the Maharaja of Jodphur, decorating his extraordinary new palace. Interestingly enough, at about the same time, another maharaja – of Jamnagar – helped to save over 500 Polish orphans who had been deported to Soviet labour camps. Of course, Nowicki’s passage to India was a consequence of war. However, not quite directly. Nowicki made it to India in the year 1950, and this was a completely different India to that of Norblin. While Norblin worked for maharajas before the sun set on the British Empire, Nowicki worked for the independent state that emerged in 1947, after the collapse, or retreat, of the British from India. Nowicki received a commission which was at that time largely known and hyped in the international press as an architect’s dream. He was offered a fantastic opportunity to design an entirely new city – Chandigarh. Yet whilst the name of the city is very famous in the history of architecture, sadly, it is now not directly associated with the name of Maciej Nowicki. KP: His commission to build a new capital city for Punjab in 1950 was the kind of project that few architects can ever dream of. Nevertheless, Poland has an unusually rich legacy when it comes to the building of so-called “ideal cities” from scratch. MU: There are indeed, especially from the 16th century, cases of absolutely beautiful, perfectly laid out ideal towns. Their model is of course derived from the Italian Renaissance. However, in Poland, their plans were very intelligently modified to suit the topography, the most famous example being Zamosc, founded by the Zamoyski family. What was unique is that these cities always incorporated the houses of worship of four to five denominations – Jewish, Armenian, Greek and Roman Catholic. So Poland indeed has a long tradition in this respect. And moving forward, in 1950, the same year when Nowicki drew his vision of Chandigarh, his colleagues that remained in Poland were designing yet another ideal town – this time the industrial new town of Nowa Huta near the so-called “reactionary” Krakow. KP: Nowicki himself, at the end of the Second World War, became involved in plans for the rebuilding of the capital city of Warsaw, which had been all but completely annihilated. MU: Naturally, the commission to build Chandigarh, completely fantastic and spectacular as it was, did not come from nowhere. Nowicki had been a rising star of Polish architecture in the 1930s. In 1945 he started work on a vision for the rebuilding of Warsaw. As you know, Warsaw was to be razed from the face of the earth, according to Hitler’s wish. And almost 90 percent was destroyed. Nowicki’s family was evacuated from Warsaw after the Uprising against the Germans – a conflict in which he himself fought as a lieutenant of the underground ‘Home Army’, as was usual in those circles. He and his family ultimately made it to Zakopane and Bukowina Tatrzanska. He gathered a team there, and then, within the so-called Bureau for the Rebuilding of the Capital (Biuro Odbudowy Stolicy) – a completely unusual institution that consisted of about 2,000 architects and engineers – Nowicki received an official commission to work on a vision for the rebuilding of Warsaw. His plan was very interesting. It encompassed several solutions that somehow came to be after the war. For instance, ironically, Nowicki envisioned the greatest centre of governmental power as being right where the Palace of Culture was built. However, this legendary project remained just that – only a vision on paper. For in December 1945 the Nowicki family left Poland for America. KP: Once in America Nowicki quickly gained a reputation, in spite of having certain problems with his legal status as an architect. What marked him out as so innovative amongst his peers? MU: I think it has to be remarked, discussing the legal problems of his stay, that there is an interesting parallel with the fates of Maciej Nowicki and Czesław Miłosz. Both Miłosz and Nowicki left Poland right after the war as official delegates of the Polish state. Maciej Nowicki didn’t flee Poland. He was sent as a cultural attaché to New York, also in a way repeating the career of his father, who had been the first consul in Chicago of the reborn Polish Republic in 1920. So Nowicki left as an official attaché, his mission to advertise for the rebuilding of Poland, and already in New York, due to his repute and connections, he was invited to join one of the most unusual architectural teams ever assembled. It was the so-called Workshop for Peace. He was on a team designing the headquarters of the United Nations. He was a special consultant, working with names such as Le Corbusier, Oscar Niemeyer and Wallace Harrison. So the problems with the legal status occurred only later, when the Nowicki family decided to stay in America. Of course, they knew what was going on in Poland, and how the Soviet repression was getting ever more gruesome. The problem that Nowicki faced – like many of his profession – was that for quite some time he was not an official member of the American chamber of architects, even though the family had been granted a permit to stay in America. He had to collaborate with several established architects – some of them very famous, for instance Eero Saarinen, the author of the TWA airport in Washington. Some were less celebrated, and let’s face it, less generous in remembering Nowicki’s contributions. But what indeed catapulted him to fame was the invite to set up a school of architecture at the North Carolina State University in Raleigh. This was the beginning of his great American adventure. KP: And he was involved in the erection of a building which is still very much admired in Raleigh – the Dorton Arena. MU: Well, the tragedy was that he was unable to erect what he designed. Nowicki, having been appointed the acting Dean of the School of Architecture in Raleigh, indeed received a commission that was not only to change his life, but was to change the course of architecture of the 20th century. His invention – and I’m talking here about the invention and design of the first hanging roof – was completely groundbreaking. The idea was ingenious. It was like Edison’s invention of the light bulb. It was in fact E=mc2, because it was very simple, very elegant and yet no one had hit upon it before. It is one of those inventions that are genial in their simplicity, only that you have to have that flash of genius. Nowicki’s invention was a great change in the entire approach to the roof, which had always been something that was stiffly supported. Moreover it hung from two intersecting parabolic arches. So he not only invented the hanging roof, he also applied – for the first time – a hyperbolic paraboloid, a form that these days is absolutely commonplace. It can be generated by computers in a few seconds. But at that time is was a novelty, even though the form itself is incredibly logical, and has been applied by nature itself. It has to be said that this completely innovative, beautifully geometrical design had a lot to do with nature, with agriculture and even with livestock. This fantastic feat of engineering was very rightly called “The Cow Palace”. It was conceived as a hall for cattle exhibitions, for the annual agricultural fair of North Carolina. And as it was, the structural legacy influenced a whole range of famed buildings, such as Kenzo Tange’s Olympic Hall for Tokyo in 1964, or Eero Saarinen’s Yale Hockey Rink. KP: As we know, Nowicki died tragically on his way back from India, whilst in the midst of preparing a project for the new capital of the Punjab. Some of his designs seem quite advanced. The project passed to Le Corbusier, but how much of Nowicki’s vision can we say endured in Le Corbusier’s work? MU: Well, that is a question that was sadly never largely discussed, apart from a series of articles by Lewis Mumford, one of the most notable architectural critics of his age, and a friend of Nowicki. But I don’t agree that Nowicki’s design was advanced. It was a concept. A concept that was of course very coherent and consequent, but it wasn’t a ready building design as such. Albert Mayer, an American developer, was the driving force behind the project. Mayer received the commission from the Indian government, and he and Nowicki were working on the plans from the beginning of 1950. Yet when they went to India half a year later, they found that most of the drawings that they had been sending from America had somehow disappeared. Maybe to a degree this wasn’t so bad, as like so many going to India for the first time, Nowicki was completely overwhelmed by the beauty of the country, by the absolute richness of life, by the contrasts and by the sweeping vistas. Chandigarh is set on a slightly inclined plain, with a distant panorama of the Himalayas. And thus, working on site, Nowicki created a design that in terms of architectural and urban planning contents, was as groundbreaking as the fantastic structural ingenuity of the Dorton Arena in Raleigh. Nowicki was a great follower of Frank Lloyd Wright, and he was working on a combination of Modern architecture and the organic tradition. In the opinion of many, and I agree, he had a great talent for the organic, and a great feeling for local conditions. He wasn’t a doctrinaire modernist like Le Corbusier. As early as 1945, he was lucidly criticizing the Modern movement and its functionalist doctrine. So in India, being confronted with this great task and thousands of years of vernacular architecture, he had the chance – an architect’s dream – of combining these elements. 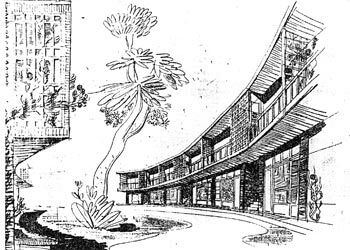 Yet as in the case of Warsaw, this fantastic organic vision of the city of Chandigarh largely persisted only in the form of drawings. They at least were saved, thank God. The set of drawings of the so-called Superblock 37, one of the units constituting the plan of Chandigarh, shows Nowicki as an architect of great skill, with great understanding of the local conditions. And had those plans been realised, we could talk of a real breakthrough in urban planning, and I imagine that the history of world architecture would not be confined and petrified in the form of huge pre-fabricated slabs, as it was for many decades to come. Le Corbusier did utilise a few of Nowicki’s ideas. However, the plan conceived by Nowicki and Mayer was much more human, much more intricate and much closer to life than the epic Cubist monuments of concrete as built by Le Corbusier. KP: On the outgoing journey of his final visit to India, Nowicki wrote a moving letter to his mother whilst flying over Europe, noting that he was passing close to his homeland, and yet of course by that stage he was unable to return, for political reasons. His death at 40, at the peak of his powers, with so much unrealised work ahead of him, does seem to mark him out as very Polish. MU: Of course; I see him as one of these classic Polish Romantic geniuses. I think it’s absolutely not exaggerating to compare him to Chopin. His talent was brilliant, his interpersonal skills were very high, he was a charming, appealing gentleman. He was completely possessed by the idea of architecture, not, as his friends and former collaborators told me, in an arrogant way. He wasn’t one of those domineering functionalists of 20th century architecture who knew better and felt that they were messengers of God who must dictate how we should live. His death was a great loss, and sadly, the fact that he fell into oblivion was its consequence. Marta A. Urbańska’s doctorate, “Maciej Nowicki – Humanist and Visionary: An Architect and His Times” was completed in 2000. She would like to thank Professors Robert Burns and Roger Spears of the North Carolina State University School of Architecture in Raleigh for their invaluable help in her research. A conference dedicated to Nowicki is being held at SARP Warsaw on 18th of November.